We are a full service fire protection company specializing in portable fire extinguishers. We sell, service, inspect, test, recharge portable fire extinguishers in accordance with NFPA-10. We also service and inspect emergency and exit lights, inspect fire sprinkler systems, kitchen systems and fire alarms. Please contact us for details if you would like a complete fire protection package quote. We can help your business stay in compliance with local, county, state codes as well as insurance requirements. We have been proudly serving the greater Washington DC Metro area since 1976. Contact us today to have an Omega Fire Protection service specialist perform a no obligation assessment of your faciltity. We will be able to determine what types of risks your company faces and suggest the proper fire protection equipment and fire extinguishers that will most effectively be able to counter those risks. 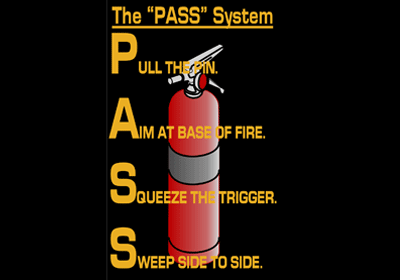 Always remember the word PASS when using a fire extinguisher.